This entry was posted in Alternative Medicines, Health, History, Medicine, Science, Skepticism, Vaccines and tagged alternative medicine, alternative medicines, bacteria, bacterium, cvs, duck, flu, health, medicine, Oscillococcinum, pharmacy, quack, science, skepticism, viruses by Mark Aaron Alsip. Bookmark the permalink. (Just playing devil’s advocate here) – what do you make of the 1989/France study mentioned in the first CVS link? Is there some obvious flaw they’re glazing over or was it just blatantly fraudulent? Thanks for reading and commenting Mike. I wouldn’t cry “fraud” over that one study so much as blind luck or false correlation. In researching this, the two things that jumped out at me are that (1) nobody’s ever been able to reproduce the results from that study and (2) by the manufacturer’s own admission, the chances of actually finding active ingredient in the product that goes out the door are essentially zero. I would think if Oscillococcinum was effective in fighting the flu it would show consistent results in multiple studies. That would mean in a few studies it would fail, of course. But you’d expect more than one good result. And then, as I understand drug research to work, some mechanism would have to be shown for one or more components of Oscillococcinum to affect the influenza virus. I don’t think sugar can do that! Do you mean the Cochrane evidence that was withdrawn because of poor data? “WITHDRAWN: Homoeopathic Oscillococcinum for preventing and treating influenza and influenza-like syndromes. Note. Vickers meta study is old version. I have been using Oscillococcinum for atleast 10 years and I am here to tell you that without a doubt! It is legit! It has saved my bacon more times then I can say. While I was working, if I got the yucky burps or the runs, I would take one vile, then 1 to 2 hours later another one. Very rarely did I need to take 3. I don’t give a rats patuty what any fixed pharmaceuticals reports has to say, this stuff works! I use it… My kids use it and my grandkids use it! Thanks for reading and commenting Bonnie. Since there is LITERALLY nothing in Oscillococcinum except for sugar and water, what you are claiming is that sugar and water cure the flu. This isn’t a pharmaceutical report at work, it’s the ingredients on the side of the box along with basic high school chemistry that we should have all learned and remembered. We could go deeper and ask if you or anyone you claimed as “cured” were actually diagnosed with the flu, but perhaps the #1 thing I’ve learned in writing this blog is that once a person latches onto a belief, they’re rarely willing to let go of it, despite the evidence. I would dearly love to continue this conversation with you though, if you’d care to. However, we must begin with the fact that there is, with 100% certainty, nothing–absolutely nothing–in the product reviewed here except sugar and water. If you’d like to pick up the story from there, please do comment again. Before dismissing this medicine you should have an understanding and knowledge about how homeopathic medicine works. No homeopathic medicine has “active ingredients” as far as what the FDA defines as active ingredients. It’s based on quantum physics and the evidence that “like cures like”. The aspect of homeopathy that is implausible for many people is that the medicines are often – though not always – diluted to the point where there may be no molecules of original substance left. One of the leading current proposals for how such ‘ultramolecular’ dilutions work is that water is capable of storing information relating to substances with which it has previously been in contact”. The “energy signature” of that substance, although intangible is in fact very active and very effective. I have used Occillococcinum for years with great success. I have given it to my family member and recommended it to friends, and they too have had great success. No one in my family takes the flu shot anymore because of how effective Occocillococcinum is. If taken at the very onset of symptoms, the symptoms and sickness are gone completely within a couple of hours. If it (the flu) has already taken a hold of you for a couple of days before you take the medicine, then it will take two or three doses and about a day to a day and a half for it to eradicate the flu. I have found that it also works well with other virus’. Thank you so much for reading and commenting. I think the biggest, obvious failure for Occocillococcinum and “like cures like” is that nobody has ever tested any of the ducks that go into it to see if they are positive for the flu virus. If you don’t know the duck had the virus, how can you claim it was “like” the virus in your body? I dismiss homeopathy based on a fairly deep knowledge of the water molecule based on 6 years of university study and, more importantly, the ability to read and understand literature written by experts who understand it at a level even deeper than I do. No evidence has ever been produced for homeopathy’s claim of “imprinting” on molecules. The latest figures I can find for flu deaths are from 2011, when an estimated 54,000 people died. The flu vaccine is safe, effective, and protects not only the person receiving it, but provides “herd immunity” to the general population. This “Like cures like” nonsense is a pseudoscientific conjecture based loosely off the Quantum Entanglement theory (which is more of a Hypothesis than a legitimate theory). It’s also really bad science. Take a physics course in University and you’ll instantly understand how ridiculous that whole notion is. The first “study” is just a homeopathic journal article. Not really what we’d call science. The second two references are actually the very same link and, looking at the abstract, the referenced material isn’t about water having a memory. Your opinion of science is bad argument. The second reference celary refer to the memory water phenomena, please read the full text, the experiment is replication of Benveniste experiments about of transference of electromagnetic signals (high diluted). An ad hominem attack is an attack against a person and that never happened in my reply, which is quoted in full below. And you’re playing bait & switch with your links and quotes. You linked to PubMed, which is NOT a homeopathic journal. Please, this is your opinion. About of ad-hominem attack apply with the refused of homeopathy journal. Stopped right in the quantum physics part. You clearly don’t understand how quantum physics works. Wow, wow, wow …. there are 6 families of BS in the universe, and this defense of homeopathy successfully deploys every one of them. Family 1) Complete and Utter BS: “like cures like”. If you swallow a bottle of bleach, you will not be cured by swallowing another bottle of bleach. I do not imply that homeopathy advocates this specific cure, but clearly the “like cures like” aspect of the philosophy only applies to those likes that do cure likes, whereas the likes that worsten likes, like entire bottles of bleach, are not like that. In other words, it is not a principle at all, it is Complete and Utter BS. Family 2) Nonsense: Ultramolecular Dilution. Water Memory. Energy Signature. Umm, ya, if you make up words they can support any argument you want, in that you made them up to definitively do so. If I say that all homeopaths suffer from suprarespective exdeceptivity, and therefore they are all full of sh*t, you cannot argue with me, because that phrase means precisely that all homeopaths are full of sh*t. Nonsense. And true. Actual science also invents new names for things, but only after they are shown to be actual things. Homeopathy attempts to create reality by filling the world with invented terms. Family 3) False Witness: Homeopathy is based on quantum physics. Nobody who understands quantum physics would waste their time arguing with an idiot like you, so you can lean on their science as much as you want and nobody will ever push back. But let’s just face it … you don’t know a single thing about quantum physics, and homeopathy is not based on it in any way whatsoever. I think what you mean to say is that homeopathy borrows an undeserved legitimacy from quantum physics because quantum physics uses statistics and uncertainty to provide a mathematical description of the way the world behaves, accessible only to those who understand the advanced mathematical and scientific concepts, and homeopathy uses statistics and uncertainty to obfuscate its utter nonsense in a way that borrows the aura of actual science and is accessible to nobody. But quantum physics takes real observations and attempts to explain them mathematically. Homeopathy takes real math and uses it to obscure a complete absence of any observations. Family 4) Irrefutability: “intangible yet effective” … .IE, you can’t see it, smell it, or touch it …. it is impossible for you to distinguish between its existence or non-existence. But it is effective. This comes down to blind faith. If the effect occurs (someone gets better) you just have to believe that the homepathic cure caused it. Because being intangible, there is no way other than blind faith for you to make that association. It is irrefutable. Family 5) Author’s Testimony: Author followed BS procedure, author didn’t die, therefore BS procedure cured whatever author wants it to have cured, and therefore it will also do so for all other people in all circumstances. Guess what, I also get flu-like symptoms from time to time, and you know what I do? I scratch my scrotum with a Mercedes Benz hood ornament stolen by a one-legged street urchin, and I almost always feel better two hours later. If you adopt my approach, I will adopt yours. Just because you believe something works and you haven’t died yet does not mean it works. Certainly nobody who has ever died by relying on your BS cures will be around to employ Author’s Testimony against you. Family 6) I’m waiting. You only used 5 families in this comment, but I’m sure you have more. Isn’t the “like cures like” philosophy used in vaccinations? I was never taught that vaccinations are so much a “cure” as a preventative measure. They prepare your immune system so it’s ready to fend off a pathogen in case it encounters it later. I think it’s a stretch to say that Samuel Hahnemann understood viruses and the immune system when he pushed the “like cures like” philosophy long before viruses were discovered. I understand where you’re going with the analogy and it’s an interesting one. But I don’t think it would hold up if, for example, you were going to try to cure someone suffering from swine flu by injecting them with the H1N1 virus. Wow…. They must be paying you by the ‘shillions’ ? Sounds like a case of ‘Big Placebo’ working its Woooo….. I don’t feel that homeopathy is all its qwacked up to be…. Sara. the “like cures like” philosophy is not used in vaccinations. The only philosophy relied upon in the development of vaccinations is that the scientific method is the only legitimate means to validate new knowledge and understanding. Beyond that philosophy has nothing to do with it. Vaccinations thus rely on an actual understanding of human biology, actual knowledge of how inoculation works, actual experiments, actual learning and knowledge. It relies on the rejection of any idea found to be false through all this process, regardless of what philosophy or other spark of creativity led to the idea. The fact that some real medical remedies have something in common with the disease they cure does not validate this baseless foundation of homeopathy. If homeopathy says to treat (like with like), then by that precept the “Oscillocci” bacteria should only be affective in treating a bacterial infection, not influenza, which is viral. Correct? If homeopathy says to treat (like with like), then by that precept the “Oscillocci” bacteria should only be affective in treating a bacterial infection, not influenza, which is viral. Correct? Also, when you say, ‘I have taken it for years and have not had the flu’ I say to you, I have taken nothing for the flu for years and have not had the flu, so how do you know that you not having the flu is a result of having taken that, when you might not have had the flu anyway without it, based on my experience? Go Donde! This guy has no clue what he’s talking about. Homeopathic remedies have been used for hundreds of years with great success. In fact the 1st hospital in the US was a homeopathic hospital. I’ve used them for over 20 years and have avoided antibiotics. Bet Mark’s never used one! Oh, I have used them! One of my favorite parlor tricks it to take an entire bottle of homeopathic sleeping pills in one gulp. No active ingredient, so no sleepiness. The same applies to Oscillococcinum, which literally contains nothing but sugar. We could walk through the chemistry together if you’d like, starting with the ingredients listed on the box! As for the first hospitals using homeopathic medicine, I believe they also used to cut veins open and bleed people in order to release bad humours and operated with anesthesia or antiseptics. Medicine has come a long way since then. If the “Energy signature” is intangible as you say, how do you know it is this which is “effective”? You are using a logical fallacy to support your claim, “I got sick, I used it, I got better”. How do you know it was influenza? How do you know it wasn’t a mild cold? Lastly, what is this evidence you speak of that “like cures like”? Reliable and peer-reviewed citations would be wonderful. 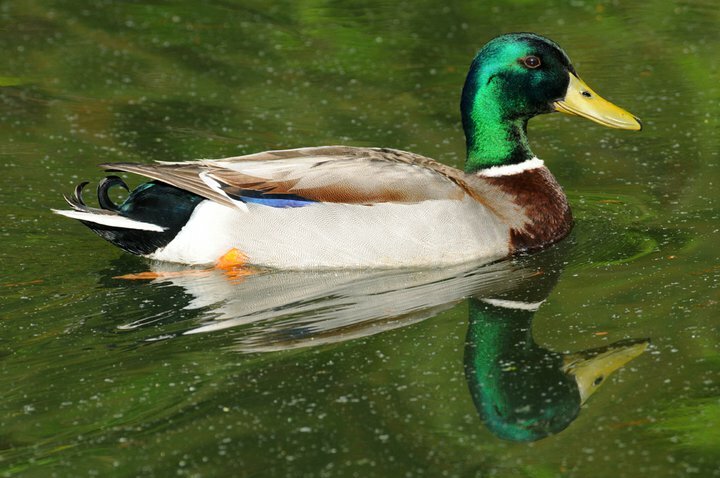 If a water molecule can be so imprinted with information by a duck molecule that the water can convey an immunization message to a human body even after complete eradication of actual duck in the water …… are there numbers large enough to convey how much BS is conveyed to homeopathic patients by the BS molecules transferred from their carers through the water’s memory? And is the water capable of forgetting or are all the seas of the earth filled to saturation with the energy memory of homeopathic BS molecules? Or please see the experiments published by Ruiz Vega (Institute of Physics, Mexico); Kononalov (Russian Academy of Sciences); and others scientists of Brazil (AR Miranda), India (Gangar), Italy (Elia and Niccoli); France (Demangeat); USA (Rustum Roy, Gary Schwarz), etc. then YOU can shoot him again, in the same place, and he’s cured? Now, must it be the same gun, or at least the same model in the same caliber, or will any gun in the same caliber work…. or will any gun in any caliber suffice? Any homeopaths willing to sign a shitload of waivers and participate in some clinical trials? And who gets to be the “control subjects” who get no second “healing” shot? You completely lost my attention when you said, “When I get the flu shot”. How can you be so logical about this quack remedy but support the flu shot? Why is it so difficult for people to understand the difference between a life saving vaccine for the mumps or polio yet not see the damage the atrocious flu shot does to your immune system? Next time you feel the urge to follow perfectly healthy, brainless twits into Walgreens for their annual injection of damaging chemicals that have been proven to increase your chances of getting the flu and becoming dependent on Big Pharma’s whims, eat a freaking banana instead, followed by an orange and then an apple. Stop being a sheep, allow yourself to get sick, and build up your own immune system. I am not in any way an anti-vaxxer but the flu shot is a joke that the pharmaceutical companies take straight to the bank while only you suffer the consequences. Note: If someone is deathly ill from the flu, or already has health issues, then flu remedies may be required, but for healthy people to subject their healthy system to a flu shot is ridiculously ignorant. I’m sorry, but flu vaccines for someone already suffering symptoms is a little too little, a little too late. Suggesting such hints at a sub-par understanding of why the flu vaccine is given and how it works. Giving it AFTER an infection would be meaningless. Your statement about giving damaging chemicals to health people via the shots… do you have any peer reviewed studies to back this up? I have plenty to show that’s not the case, s I as just asking. Getting yourself sick to build up your own immune system is a very poor idea. You’re gambling you’ll be able to recover. Many lose. Bananas, Oranges, and Apples, cannot cure diseases, and if you believe they do, we may not have common ground for discussion.. I said flu remedies for the already sick (see a doctor). I did not say give flu shots for the already sick. I did not say get sick. I said allow the common flu to work its way out of your body, like a cold. Proper care, enough liquids, giving it a few days …It’s a common flu, not a disease, and not an epidemic.I also did not say bananas would cure diseases. I said they could prevent the flu in healthy people. Eat right will prevent colds and flues. Polio? Go get a shot. Not that hard to understand if you read what I said. Go find your own studies. Influenza kills tens of thousands of people each year. It’s most definitely a disease–a serious and highly infectious one. A basic understanding of the virus behind the disease should be enough to let you know that eating a banana will not help you in any way, either before or after, but I am always open to new information. That’s why I ask for studies. I agree that homeopathic quackery should not be sold, especially in a pharmacy. Your article, however, seems to imply that this is a CVS product. The same product is sold at Walgreens, Rite Aid, Walmart pharmacy department, drugstore.com, and many other pharmacies and retail stores. Please encourage your readers to ask all of those companies to stop selling this crap. A valid point Patty. I should point out that this is a CVS-branded product (please see photo accompanying the article). They took the Boiron product and re-branded it. I picked on them because I was able to walk into a CVS store and find it on the shelf. This doesn’t let other stores off the hook. I’ve gone into my local Walgreens and Walmart looking for oscillococcinum but have not been able to find it on the shelves. I am still looking and do plan on writing the same type of condemnation if/when I find the “drug” there. I found it online (Amazon) and wrote a scathing review which is still up and drawing comments. So you’re very correct in calling me out on this–I’m sure CVS isn’t the only place selling this stuff. When I wrote the article I intended to “catch” the other stores and call them out in follow-on articles. I just haven’t been able to do it yet. In the meantime, I think it would be appropriate to amend “If It Quacks Like A Duck” as you suggest. Thanks so much for reading and commenting! Thanks for the reply, Mark. Am I missing something in the picture? I don’t see any branding except Boiron. Patty, please see the link below. 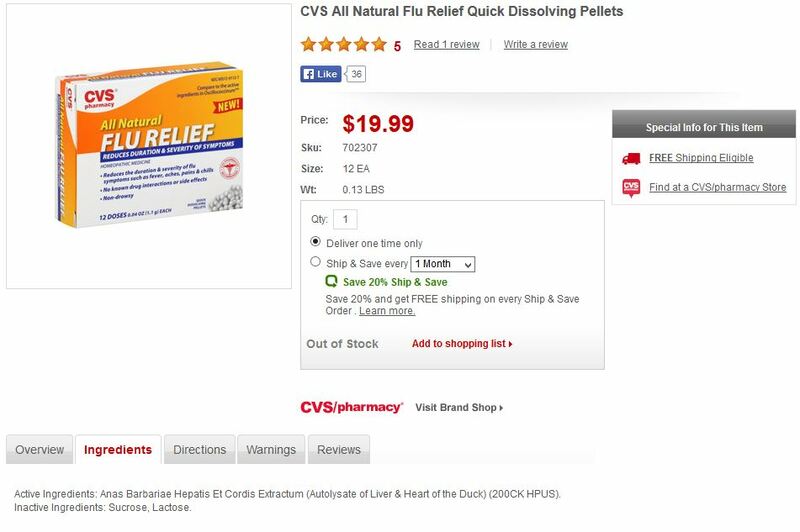 CVS-branded oscillococcinum sells for $6.00 less than the Boiron version. Same count (12 each) and dilution factor (200C). Sorry for the confusion. I updated the article to include screen snapshots of both packages. Thank you for pointing this out to me. Please let me know if you find any other discrepancies. I emailed them the following note, we shall see if they respond. 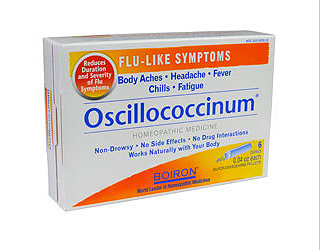 I was quite dismayed to see articles all over the web talking about this homeopathic and useless remedy “Oscillococcinum” being sold by CVS. CVS has been chartered by my healthcare provider as a responsible and reputable company, even able to provide medical screenings for us. At first I thought it was a joke, but when I searched on the CVS website I found there were 3 products that were returned. As a company that has gone as far as to remove cigarettes (while profitable) as harmful from its shelves to promote its healthy agenda, I thought you would want to know about this. While Oscillococcinum itself is not likely harmful, it might prevent someone from taking a medication with real efficacy and value to your customers. Thank you for contacting us here at Customer Relations. I am happy to respond. I have notified our Product Team of your concerns. If I can be of any further assistance, please feel free to contact me directly by clicking on the link below. The reference number for this contact is 4652814. That’s great Leonard, thank you for taking the time to do this. I haven’t been able to even get a response from CVS yet so you’ve achieved more than I have. I’d be interested to know if you receive any further communication from them. If you remove this product from your shelf i will remove my business from your stores… Please pass that on to your Product Team. I spend a lot of money on health and wellness and preventative medicine for my family. After i adopted this “lifestyle” change for myself and my family, i have seen a decrease in sickness by at least 75%. I am not here to argue science or quackery. My health improvement is all the tests and facts i need! I’m not a seller of any product so I’m not sure who your comment is directed to. I wish you were here to argue science and quackery. It’s what this blog is all about. Snake oil salespeople who sell the alternative cures are welcome to comment here. Unlike quackery sites, people with dissenting opinions are welcome and aren’t banned. Their posts aren’t deleted. But personal stories aren’t convincing. “Healing Or Stealing? : Medical Charlatans in the New Age” reference is old book and contains obvious errors in the Benveniste affair. Thank you, Mark Aaron Alsip, for this informative article. I believe this useless “drug” is sold in many other stores and health stores, not just CVS. Thanks for reading and commenting Susie. You are correct. After I published last year, it was pointed out to me that this nonsense is popping up on shelves everywhere. I hope to use the upcoming flu season as an impetus to write a follow-up. I went after CVS in particular because the discovery of the product on their shelves coincided with their (admirable) policy to stop tobacco sales. I couldn’t wrap my brain around the contradiction and sat down and banged out a quick post. You are right though, this needs further treatment! I know ppl who use OSCILLOCOCCINUM and it worked ! Carrie – how do you know it worked? Say I recite a magic incantation today, with the effect that tomorrow morning you should wake up and continue your life. And say tomorrow you do in fact wake up and live. Will you believe my magic incantations have the power of life or death over you? What if I tell you that I have tried this. In experiments. I’ve tried it on 75 different people, over 40 times each. Every one of them woke up the next morning, every single time. Now do you believe in my powers? What if I show you equations? What if I print my incantations and sell them through a new branch of medicine call idiopathic medicine? If I wrap it all up in enough trappings of reality, will you believe in my powers? And if not …. why do you believe the oscockicookium worked on these people? Hi Mark, I read your commentaries, but I have to disagree with you, during several years I was punished for the flu and other diseases, but after to know this Oscillococcinum , I can affirm this Drug is really incredible, I can affirm this drug is not a sugar pill, I have 54 years old and I have more disposition than 10 years ago, my pressure is good, nowadays, I do not take drugs and the main commentary, I have completed more than three years without flu or other complication. Hi Dennis. Thanks for reading and commenting. If you would kindly read the ingredients listed on the package, you will indeed find there is nothing in it but sugar. It is, literally, by the very definition, a sugar pill. I’m glad you find yourself in good health and it’s my sincere wish you remain that way. I’m sure you are convinced you found a cure, but, alas, it truly is pure sugar. If it is so fake, how did it cure my dog? He didn’t know he was being administered a placebo or not… so, there is no mind over matter involved here. Also, if it’s fake, why are holistic/homeopathic doctors getting death threats and being killed by big pharma? Just because you don’t understand something, it doesn’t mean you should knock it or dismiss it as a “quack” practice. Humans don’t have a brain large enough or complex enough to even begin to understand God, or the idea of, but that doesn’t stop people from believing. Just saying. What evidence do you have that your dog (1) had the flu and (2) was “cured”? I’m not aware of a single doctor “killed by big pharma.” Do you have evidence otherwise? Sorry, we must do better in science. Lo, the limitless capacity for gullibility of human ape brains. If water can be “Imprinted” than all the water in the world would be doing crazy wacky things to our bodies, because water is recycled not recreated, also the water I drink would effectively possibly have this duck bacteria…which the flu is a virus….. . And water touches a ton of stuff….so I just can’t get on board with this pseudo science theory. I believe in the power of the human mind to heal….So yes positive thinking and lowering stress can help you heal. But that only goes so far, also in infants sugar actually has an analgesic effect, so the effect of sugar pills is it would ease some of their pain in infants, hint not a placebo effect in infants. Not sure how that would correlate to other children. (http://www.cochrane.org/CD001069/NEONATAL_sucrose-analgesia-pain-relief-newborn-infants-undergoing-painful-procedures). So if anything is doing anything, save some money and take a little sucrose and lactose. But don’t buy it marketed for 20$ that’s just insane markup. I cringe at speaking on behalf of the homeopathic whack jobs, but I’ve tried this “If water has memory then ….” approach before where you describe ludicrous and imaginative implications of water memory. And the answer I always get is that water’s memory is only provoked by the specific method of repeated dilution in the manner of homeopathy. In other words, it only remembers when homeopaths want it to remember. In all other situations it looks the other way. Water, it seems, is not merely unforgetful but also considerate and obedient. Water would make a great friend! Wow, you are really unintelligent aren’t you? Every pharmacist in Europe is trained in homeopathy. And you are so much smarter than any of them aren’t you? Get a life. Don’t buy it. Leave us, who successfully use homeopathic products, alone. This is a free market society. Move on. Thanks for reading and commenting Kate. I have a favor and a question to ask of you. The favor is that will you please write back and respond to the following question: Assume I have an IQ of 10, making me very unintelligent. Assume every person, not just every pharmacist, in Europe is trained in homeopathy. Now, how does that change the fact that oscillococcinum literally–LITERALLY–contains nothing but sugar, and is therefore incapable of curing you from the flu, reducing the longevity of your flu, or even reducing your flu symptoms? Please Kate, do write back and answer this question. I would greatly enjoy having an on-topic conversation with you. Thanks for posting this. Someone recommended I get this to treat a cold… I didn’t know it was a homeopatic remedy but the moment I found out I knew it was bs. Thanks for elaborating and explaining it, with reason and references. And I’m still amazed at how many people still believe that wet sugar pills do anything for them. How much do you think can be attributed to the placebo effect? Thank you for the kind words Oscar. I’m glad the post was of use. My guess is that the placebo effect is much in play here, combined with the fact that, according to the doctors I’ve spoken with, many people misdiagnose the flu, thinking they have influenza when it’s only a common cold that will resolve itself in a few days at most. If the last thing you did was take a sugar pill before your body’s immune system kicked in and fought off a simple bacterial infection, you may be inclined to credit the sugar pill. And, to be sure, that’s ALL these things are–sugar pills! This did wonders for me. I was unable to get an erection for several months. I took Oscillococcinum after a friend recommended it to me for a cold. I don’t know if it helped cure my cold any sooner but I am now able to get an erection on a regular basis. I am not saying it gives me an erection when taken but I am able to obtain one when needed.